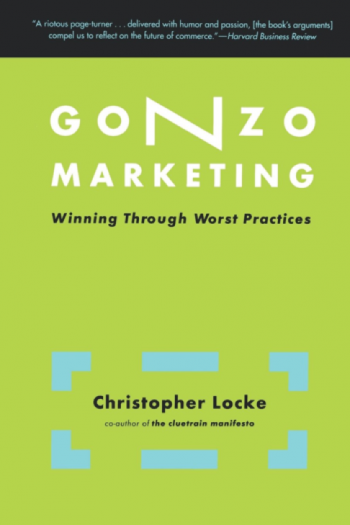 From the author of The Cluetrain Manifesto comes Gonzo Marketing, a knuckle-whitening ride to the place where social criticism, biting satire, and serious commerce meet…and where the outdated ideals of mass marketing and broadcast media are being left in the dust. As master of ceremonies at the wake for traditional one-size-fits-all marketing, Locke has assembled a unique guest list, from Geoffrey Chaucer to Hunter S. Thompson, to guide us through the revolution that is rocking business today, as people connect on the Web to form powerful micromarkets. These networked communities, based on candor, trust, passion, and a general disdain for anything that smacks of corporate smugness, reflect much deeper trends in our culture, which Locke illuminates with his characteristic wit. Gonzo Marketing is not yet another nostrum for hoodwinking the unwary. It’s about market advocacy. It describes how “the artist formerly known as advertising” must do a 180. It’s about transforming the marketing message from “we want your money” to “we share your interests.” It’s about tapping into, listening to, and even forming alliances with emerging online markets, who probably know more about your company than you do. It’s a hip-hop cover of boring old best practices played backwards. The paradox is that companies that support and promote these communities can have everything they’ve always wanted: greater market share, customer loyalty, brand equity.